Recently I had to put together a presentation on book design for self-publishers. This is really a great chance to think about how to communicate a visual discipline into a coherent storyline about the role that design plays in creating books. I have a pet peeve about presentations that include slides. Have you ever been to one of those where the speaker just changed slides and then proceeded to read, word for word, exactly what was on the slide? That drives me nuts. So I knew I wasn’t going to do that, and I enjoy the interaction I have with the attendees, so I decided on a very loose framework that would suggest ideas about design rather than legislate a set of rules. That’s the kind of thing you always write down when you’re at the conference because it seems to make so much sense, but then you never look at it again. Self-publishers need to know enough to make sure their book is suited to the goals they’ve set. Interior design uses typography (design with typefaces) to present the author’s work in the best way to readers. Readability and easy access to the information in the book are aims of good book design. You have to decide whether you’ll hire a book designer . . . or do it yourself. Cover design: Hire a designer no matter what kind of budget you have. Book designers are aware of readers’ expectations and the conventions that rule the design of books. (fine for ebooks), but you can’t expect it to look like a professional book. The more complex the structure of your book, the more challenging it is to design. Look at the elements of book design to understand how a book designer sees them. Following the development of a book design process you can see it change from a manuscript into a book. Book cover design is a marketing decision, and you’ll need to approach it as a publisher, not an author. If you want to compete in the marketplace, hire a professional designer or book shepherd. If you don’t want to compete in the marketplace, enjoy yourself and make your book exactly as you want to. Have fun! 10 mistakes you can avoid that make your book look like an amateur production. For many kinds of books, design can have a major effect on your sales, and your satisfaction. Okay, you’ll have to forgive me for that little plug at the end. The presentation ran for an hour, during which time I had plenty of opportunity to explore these points with the attendees. I supplemented the presentation with about 25 illustrations on slides so people could see exactly what I was talking about. I recorded the whole presentation and right now I’m in the last stages of getting it ready to put up for sale as a webinar (along with a presentation I did on Author Blogging). Here’s my question: Considering the value this presentation has as a training or educational tool, do you know someone who could benefit from it? I’m interested, because this is new for me. Leave me your thoughts in the comments. Joel, this is extremely valuable information. On a personal note, I know very little about book design and your webinar would help me when working with designers that I hire to produce my book. So my answer to your question is yes! I think this gives a basic but intensely necessary guideline to ANY self-published (or to be published) authors! I hired a cover art designer and via synchonicity she was having a “clearance” of pre-designed covers and I got an ASTOUNDING deal! I love the cover of Isadora DayStar, that she did and could not be happier! Wonderful article! Joel, as a webinar it can be shared with various writing groups. I will be sure that our writring group either gets the link or that we sit down and watch it together. Keep up the great work! Wow, this subject comes at a great time for me. I have several “traditionally” published books out, but have decided (for the reasons that most of us already know!) to publish my next ones independently. I have been working with a professional designer on the cover this past week, and we are close to the final design, which I will post on the book website next week (http://mysecretsasquatch.wordpress.com/). I already had a cover concept, and a photo that I had shot for it. But I knew that a professional designer would probably be able to do far more with my concept and materials than I would be able to. And it turns out that it was money very well spent – he has done a spectacular job of it! So my next decision is regarding the design of the interior. (I have lots of time… the book is currently half-written, and I am aiming for a spring 2012 release). So, to answer your question: what would make your webinar useful for me would be if it really goes into the specifics – which I am not sure that a 1 hour webinar really could do. e.g. if you have a point that says something like “the fonts and layout must be acessible and easy to read” or something like that – well that does not actually help me to DO that. Whereas if you gave specific rules or guidelines, e.g. margin size, font sizes, distances between headings and paragraphs or between paragraphs, and showed examples of some that work well and others that do not work, that would be really valuable. So for me, looking at the points you have listed above, many of them actually seem quite vague. I am not clear as to how specific the info for each point would be. I would definitely pay $$ for a webinar on book design – but I would want to feel confident that the content of that webinar is specific and clear, and not just general principles. Thanks for your valuable and thoughtful feedback. You are correct, the talk that was the basis for this presentation was a one hour high-level look at what book design is, what it does, and why we need it with some cover design tips and fairly general information. It was designed for a general-interest audience of writers. The course you describe cannot be done in one hour, obviously. I don’t cover much of that material in my book, either. 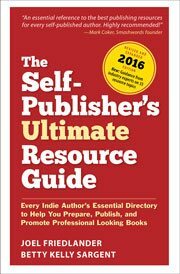 A Self-Publisher’s Companion is designed as an introduction and overview of what it means to be a self-publisher today. I am developing an educational product exactly along those lines, but it won’t be ready for a couple of months. There are, however, numerous articles in my archives that relate to specifics of typography, page layout, pagination and other specific questions you need to deal with in designing a book interior. You can access them through the topic list in the right sidebar, from the Articles page available in the Nav menu at the top, and by using the search box in the right sidebar, although that one isn’t as productive. Let me know if there’s anything specific you need and thanks again for putting your observations into words. I’d love to sign up for this webinar, when you’re ready (Lynette@AllMyBest.net). Also, I’m a member of Publishers & Writers of San Diego (www.publisherswriters.org) and a subscriber to its moderated, open-to-the-public YahooGroups (www.groups.yahoo.com, search “PWSD”), many of whose members/subscribers I’m sure would appreciate knowing about your webinar. This organization focuses on the BUSINESS of writing and publishing, and its members are predominantly self-publishers (fiction and nonfiction) plus several editors (developmental editors, copyeditors like me, and proofreaders), book coaches, and book shepherds, and even a publishing attorney or two. (Look at the member directory on the website to get a flavor for the demographics. BTW, book designers would be a welcome addition to the mix, regardless of geography.) I suggest that you seek publicity for your webinar by belonging and posting at the YahooGroups message board and also by sending a brief announcement to the editor of the organization’s newsletter, “Publishers & Writers Monthly” (newsletter@publisherswriters.org; deadline 1st of the month, e-published around the 15th to members and nonmembers who have signed up at the the organization’s home page to receive it). Another lead would be to contact the editor of “Delete,” the monthly e-newsletter of San Diego Professional Editors Network (www.sdpen.com) to see if you can have an announcement published there. I don’t know the publication deadline, but yesterday I received my May e-edition, so that’s a clue. Both PWSD and SD/PEN have surprisingly large memberships, and their websites both get excellent SEO rankings. Good luck! Lynette, thanks so much for that valuable information about Publishers & Writers of San Diego. I’ve had a look at the website and it looks like a great group, and I’m exploring the SD/PEN site also. I really appreciate the tips. Hi Joel, Thank you again for sharing your expertise. I posted this on Twitter, Facebook and 5 LinkedIn writer’s groups. Looking forward to the webinar. Definitive Serious Writers will be gathering in San Francisco over Labor Day weekend for a conference. Would love to see you there. Contact Terrence Terrence Brejla on LinkedIn for details. Amy Tan will be one of the guest speakers. This will not be an enormous conference, but a more intimate one that will hopefully get down into the real nitty gritty. I’ll be in touch with you again later. Wow, thanks for that Marcia, I really appreciate it. I’d love to talk to you more about your Labor Day event, I’ll look forward to hearing from you. Joel – I just wanted to thank you for your blog. I have found so many of your posts to be very helpful in the whole endeavor of self-publishing. I am not a professional writer, designer, or editor. I just self-published a book, but I hired someone to do the cover and format the book for Lightning Source. So I am in the “business” in a very limited way. But I have enjoyed reading so many of your articles. They’re interesting, clear, and informative for a newbie like myself. I also enjoy many of the comments, and they help me better understand what my editor is doing. I just read Top 10 Worst Self-Publishing Mistakes—Explained! and Understanding Print-on-Demand: Follow the Money. Great stuff! I’m a subscriber. Thanks. It’s great to have you as a reader, Tom, and I wish your book great success. Thanks for taking the time to comment. Joel – I think the webinar is a great idea. And thank you for all of your tips and posts. I frequently reference them on my blog. Thanks, Passive Guy, I just subscribed to your blog, which is an excellent resource for writers. Joel, I think this would be great as a “webinar.” You may already know this, but it isn’t difficult at all to take existing slides and audio and compile them together into a video, using common tools on an Mac (iMovie and/or GarageBand). Alternatively, you can use a tool like ProfCast (http://www.profcast.com/) to create a ready-made, “webinar” style video as you’re presenting (or re-presenting) with your slides: as you speak, the audio (even through the built-in mic of your computer, though an external mic captures better) is married to the slides and the software combines them into a dynamic, rich-audio file. Thanks for the link, Ed, I’ll check it out. I’ve been using GarageBand, Keynote and iMovie so far, but I’m a complete newbie when it comes to this stuff. I really like the webinar format and have enjoyed watching many of them, so I’m hoping to make something that others find useful.